Skype Web Control is a lightweight Skype web client that is available on outlook.com, msn.com and skype.com. Sign into your Microsoft account from a Microsoft web site such as outlook.com, msn.com or skype.com. Tap or click the Skype button at the top to start chatting. Can I switch between different accounts on Skype Web Control? Once you sign into a Microsoft web site with your Microsoft account, you're automatically signed into Skype Web Control. You cannot switch between different accounts in Skype Web Control. What can I send on Skype Web Control? You can send messages, pictures, files, and emoticons. To send attachments, select the attachment icon and then choose a file to send. Can I make calls on Skype Web Control? Go to any conversation in your Recent chats list or use Search. Select the audio or video call button to start a call. If you use this feature for the first time, it might ask you to provide Skype access to your camera and microphone. How do I start a new conversation on Skype Web Control? Select the New Chat button. Select the person or people you want to chat with, and then select Create to start a new conversation. How do I see my contact list on Skype Web Control? From your Recent chats list, tap or click New Chat to see your contacts in alphabetical order. Can I add someone to an existing group conversation on Skype Web Control? Select the Add to chat button, and then select the people you want to add to the group chat. How do I see all participants in a conversation on Skype Web Control? Select a conversation from your Recent chats list, and then select the Chat participants button to view all the chat participants in the group chat. To remove someone from a conversation, select the X button next to their name in the Chat participants list. How do I block someone on Skype Web Control? From a conversation, select the More menu button. Select Block contact, and then choose whether you want to report abuse. Select Block to block the person from contacting you. How do I leave or delete a conversation on Skype Web Control? From your Recent chats list, locate the conversation you want to leave or delete, select the More menu button. Select the option to leave or delete the conversation. How can I provide feedback on Skype Web Control? From your Recent chats list, select the More menu button, and then Send feedback. 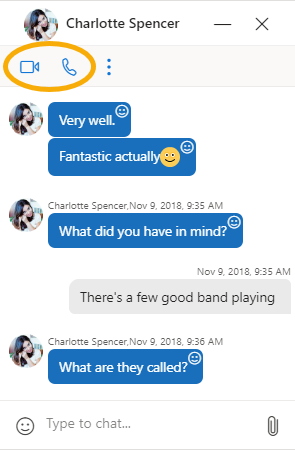 Or connect with us through Skype feedback. How can I minimize a Skype Web Control chat window? Tap or click the top bar of the of the chat window to minimize it into a tab that will stay sticky on the bottom of the page. How can I turn off incoming chat or call notifications in Outlook.com? From Outlook.com, select the Settings button. Select the General tab, and then select the Notifications tab. Under Chat and call, select the radio button next to the new chat and incoming call notification types to turn them on or off.